Part Two of Matt Austin’s interview with Sixty Inches from Center. Don’t forget to view his show at Johalla Projects, the reception is this Friday March 4, 7-10pm and it’s on display March 3-5. 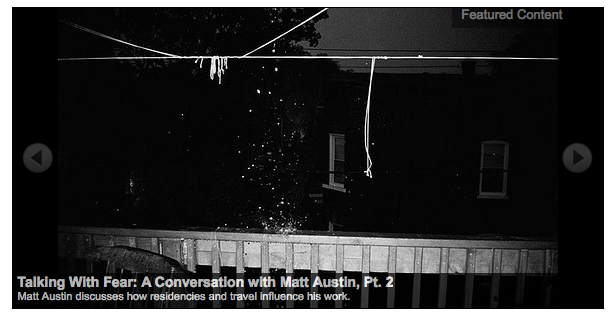 Talking with Fear about Dying Tomorrow features Matt Austin’s new work incited by a month-long road trip that followed his ACRE Residency. The exhibition features photographs documenting a variety of individualized interactions with one’s environment, such as carving into a tree or posing for a tourist photo. 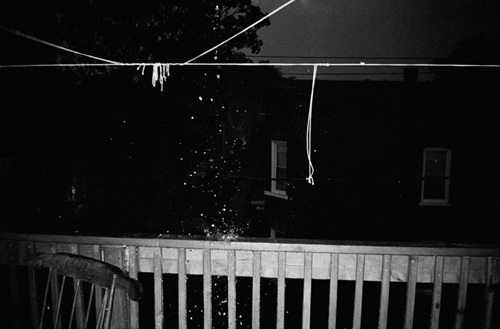 By exhibiting photographs of these aesthetic gestures, Austin is reiterating personal messages and extending them to a different audience, presenting the function of another’s visual work as no separate than his own. His work encourages an appreciation for the ways in which we recognize the common desire to feel special and tangibly represent the significance of our experiences. As a part of his solo exhibition at Johalla Projects, he will be releasing an edition of newsprints and a monograph of new work. Also, his first contribution to HomeSchool, a traveling institution for experimental pedagogy, will be held at 4pm on Saturday, March 5th. Photos from our event at Streetside, taken by Jeff Schear for Chicago Magazine. View the rest of the photos here. Great interview with Matt Austin by Sixty Inches From Center in preparation of his solo exhibition with us. The Daley Show lives on for Nick Adam: read it here.